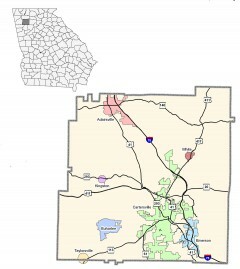 When Bartow County was established in 1832 from Cherokee County, it was named “Cass County” after Lewis Cass, Secretary of War under President Andrew Jackson. The name was of Michigan. Nearly 30 years later, General Cass’s abolitionist views became an embarrassment to the Confederate populace, and the county’s name was changed to honor General Francis S. Bartow, the first Confederate General to die in the Civil War.